3 Dudes. 18 days. 16,000 kms. A Ford Endeavor. And Indian to explore. 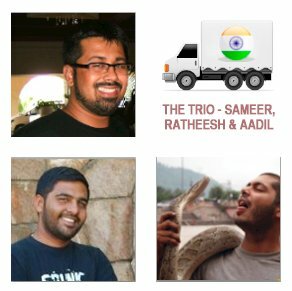 Three friends – Aadil Bandukwala (Belgaum), Sameer Siddique & Ratheesh Kumar and intend to travel to each and every state in India including that particular state’s capital city in a Car covering a distance of more than 16000 kilometers in less than 18 Days beginning June 16th 2010 from Bangalore. They will attempt this in a Ford Endeavor and their journey will originate and terminate at Bangalore. They intend to do this purely out of passion for travel. The trio are big time travel aficionados and recently came to know that someone did this same feat in 19 days and 23 hours which was festered as a record by Limca Book of Records. They intend to crack shack this feat and will be striving to break this record in less than 18 days. 28 States and 5 Union Territories including the National Capital Territory of Delhi is what we intend to touch. A minimum distance of 16,000 km will be covered between the starting and finishing point – Bangalore. When we started discussing this with our friends and family, the fact that the three of us intend to drive 24×7, 18 days on the trot for over 16000 kms, get into the not so peaceful corners of the country, most of them said we’re out of our skulls, that we’d be smitten by worms, that we’ve got to be smoking pot. That in itself was inspiration for us. Every one used a common word – impossible. However, we strongly believe those who do the impossible are often unaware that what they did was impossible. Our motto is ‘The Journey is the Reward’. Do what you believe in. These days, its difficult for anyone irrespective of whether the individual is in the corporate world or a self employed entrepreneur or a freelancer or an academician – taking over 20 days off just for a trip that your heart beats for – is quite a feat. We’ve always followed what our hearts have longed for and have always believed in our abilities. The sense we make out of this is we never know what turn our life will take tomorrow, so while we’re at it, make the most of it! We’re dreamers and adore the fact that we do so. Bangalore (Karnataka) – Vellore – Chennai (Tamil Nadu) – Puducherry (Puducherry) – Madurai (Tamil Nadu) – Thiruvananthapuram – Kochi – Kozhikode (Kerala) – Mangalore – Karwar (Karnataka) – Panaji – Mapusa (Goa) – Belgaum (Karnataka) – Satara – Pune – Mumbai – Palghar (Maharashtra) – Silvasa (Dadra, Nagar Haveli) – Daman Daman (Daman & Diu) – Bharuch – Vadodara – Gandhinagar – Godhra (Gujarat) – Indore – Bhopal (Madhya Pradesh) – Rajgarh – Kota – Jaipur – Bikaner – Ganganagar (Rajasthan) – Firozpur – Amritsar – Pathankote (Punjab) – Jammu – Udhampur – Srinagar – Kargil – Leh – Pang (Jammu & Kashmir) – Jispa – Manali – Bilaspur – Shimla (Himachal Pradesh) – Chandigarh (Punjab, Haryana & UT) – Nahan (Himachal Pradesh) – Dehradun (Uttarakhand) – Delhi (NCT) – Agra – Kanpur – Lucknow – Varanasi (Uttar Pradesh) – Patna – Khagaria – Purnia – (Bihar) – Dalkola – Siliguri – Jalpaiguri – Cooch Behar (West Bengal) – Goalpara – Guwahati – Dispur (Assam) – Shillong (Meghalaya) – Karimganj (Assam) – Agartala (Tripura) – Silchar (Assam) – Aizawl (Mizoram) – Imphal (Manipur) – Kohima – Dimapur (Nagaland) – Jorhat – North Lakhimpur (Assam) – Itanagar (Arunachal Pradesh) – Tezpur – Nalbari – Kachugaon (Assam) – Alipurduar – Madarihat – Mal Bazar – (West Bengal) – Gangtok (Sikkim) – Darjeeling – Malda – Baharampur – Calcutta – Kharagpur (West Bengal) – Baharagora – Jamshedpur – Ranchi – Chaibasa (Jharkhand) – Kendujhargarh – Bhubaneshwar – Sambalpur (Orissa) – Raipur (Chhattisgarh) – Nagpur / Chandrapur (Maharashtra) – Nizamabad – Hyderabad – Kurnool (Andhra Pradesh) – Anantapur – Bangalore (Karnataka). While they are doing this monstrous drive, they do not intend to stop at cities and check into hotels. They would be driving 24 x 7. While 2 of them keep the car on the road, one of them will every now and then catch up with some sweet sleep. Bottom line: 18 Days, 24 x 7 Driving, Over 16,000 kms, Tweeting, Blogging, Hogging and Discovering India. And just when does this trailblazing extravaganza begin? 16th June 2010. Sky Diver. Bungee Jumper. 21st Century Nomad. Globe Trotter. A few words that describe a box of adventure called Sameer. While most kids had aspirations to be doctors, engineers and scientists, Sameer very ripely expressed his desire to be a Truck Driver. Traveling is in Sameer’s blood. After having holidayed in UK, Germany, New Zealand, Azarbhaijan, Malaysia, Dubai, China and India, Sameer these days dreams of setting his footprint on the world map. As for work, Sameer is a Flight Attendant with a Leading International Airline Company. Born and brought up in God’s Own Country, Kerala, Ratheesh is as composed a man you will ever find. From Hotel Management Roles in one of India’s Largest Five Star Group’s to being a Swashbuckling Bar Tender at one of Bangalore’s hottest clubs, from freezing experiences in Leh to getting heat burns in Rajasthan, Ratheesh can never cease to surprise you. While not tripping, Ratheesh is employed with an International Airline. Aadil is the essence of overconfidence! Fast food and fast cars are his instant gratification. 27 years into life, Aadil is an entrepreneur running an executive search firm armed with a Doctorate Degree. He calls himself speculation, adventure and the spirit of pursuit. His wife though calls him an incorrigible nincompoop. While not head hunting, Aadil likes to spend time, googling around, exploring multi cultural cuisines, taking vacations now and then, riding his Royal Enfeild and killing time on his Mac. One can follow their site with their Twiter updates as to where they are at that moment. All the best to the Trio for the record breaking attempt. WELL ALL THE BEST U GUYS , BUT I THNK INSTEAD OF ONLY GOING BHIND THS RECORD U CUD HAV DISCOVERED INDIA N ITS PEOPLE N RICH CULTURE.BUT IN JUST 18 DAYS ITS HARDLY POSSIBLE. @ Manish – Thank you for your wishes. We'd definitely be sharing our experiences on our official website http://www.tantalizingindia.com – Keep following us! @ Kapil – Jungels and barren lands excite us too. Perhaps when we're back we can meet and share experiences? @ Naveen – Thank you for your wishes! Wow thats good to know mate… Even i like adventures like you. But I like going to Remote places like jungles and barren remote lands. Why dont u take a caravan . it would be more comfortable. Cheers!!!! AAL THE BEST YOU GUYS.. !!! ENJOY AND HAVE GREAT TIME. WILL LOOK FORWARD TO YOUR SHARING OF EXPERIENCES ON YOUR 4 WHEELED INDIAN CROSS COUNTRY ! Thank you for your wishes Praveen! Let me get back to you in regards to whether we can catch up with you in Bangalore! @ Vickram, Sandeep & Jaydev – Thank you for your support and encouragement! This is great guys…make sure u guys take care and have a great time. Happy Travelling. aadil sameer and rateesh . it dosent matter what other"s think . @ Aadil..wish u and ur freinds all the best! Take care of ur health and drive safely! Would have been gr8 if u had spread some social message across, apart from aiming at breaking the record! @ Manish – Thank you for your wishes! Make the most of it! Have a great time! @ Belgaumite: Wasted Gasoline? Not quite. Like we said, we're dreamers. And we're passionate about traveling. We'd like to explore the length and breath of our country. We do not see any harm in the same. Infact, we're glad we're doing it. Thats a lot of wasted gasoline!! Have you thought this through ? Now, could you do something more productive…like maybe spend time cleaning up your part of the town, there would be more volunteers helping you i'd think…..